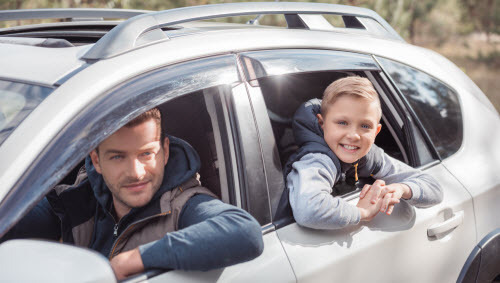 Adults may now sign up to drive to an event without signing up to attend. They can indicate whether they can drive both to and from the event, or just one way, and they can post the number of seats in their vehicle when they sign up. A list of drivers is displayed separately from the list of participants on the calendar detail page and on the Participant List report and Tour Permit Worksheet. You may now configure an event to allow guests, in which case anyone attending can register the number of guests they plan to bring along. The expired training section of the newsletter now includes classes which the recipient is required to take but hasn't yet. It also handles the fact that the old YPT training will be phased out on October 1 and replaced by Youth Protection Training 2. Troop 501 of Medina, Ohio! 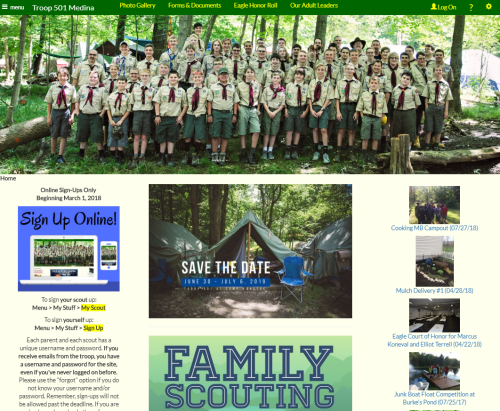 While the excellent banner image showing the entire troop in Class A uniforms at summer camp is what initially caught our eye, what really impressed us about their Home page was the insightful article on the challenge of organizing the troop to accept girls, as the troop embraces the new "Family Scouting" concept. They've done an excellent job of collecting vital documents on their Forms & Documents page, and the Photo Gallery shows years of scouting fun!